St. Patrick’s Day is in a couple of days, so you know what that means. . . Let’s get feastin’! Admittedly, we don’t deck ourselves out in shamrocks, but we sure do appreciate some good ol’ comforting Irish food. 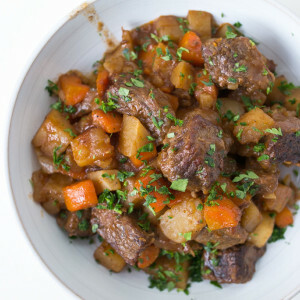 Which is why for St. Paddy’s Day this year, we’re sticking with a classic recipe for Irish Beef Stew. Last year, we featured a recipe for Deconstructed Shepherd’s Pie, which was so popular, it reappeared as a ‘favorite’ in one of our meal plans. 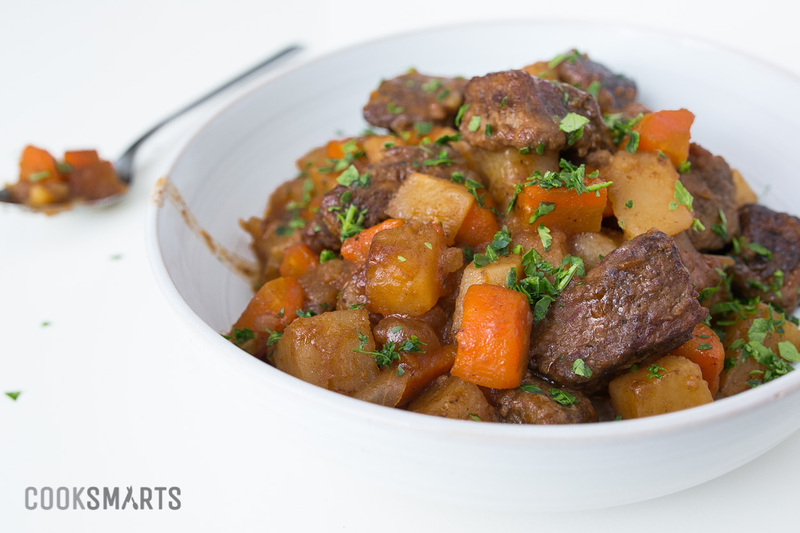 We don’t have any doubt that this year, this beef stew will become another winner dinner. What’s not to like about chunks of tender, slow-cooked beef, carrots, potatoes, and onions infused with not just Guinness, but red wine as well? There’s a bit of a pro and con to this dish, though. The con is that, since this is a slow cooker recipe, you will have to put your patience to the test as the warm and delicious smells waft around the house. We know, it’s going to be hard, but trust us – it will be so worth it. Beef requires a long time to get super tender, which is why we decided to make this in the slow cooker. But when you taste the meat in all its fall-apart-tender-and-flavorful glory, you’ll see that slow cooker was definitely the way to go. The pro to this dish, like with all slow cooker meals, is that you toss all the ingredients in and let the slow cooker do all the work, while you worry about more important things. Or you can just relax with a glass of Guinness or red wine. Because, you know, the recipe doesn’t call for a full bottle of each! Here’s a quick way to add some green to this dish: When the stew is done cooking, pop frozen peas into the microwave for one minute, then fold into the stew. Meat should be tenderized to ensure that it is tender and will absorb all the great flavors it is cooked in. Watch our quick tenderizing method in the video below. Practice your knife skills by chopping onions, carrots, and potatoes. If they’re not perfect, it’s okay; they’ll have that tasty, rustic look! Skillet – gives meat a good sear if you decide to brown the meat first. Browning the meat before adding to the slow cooker enhances the savory and meaty flavor. This step is optional, but if you have the time and don’t mind washing an extra dish, we say go for it! Slow cooker – a great investment and gets a ton of use during the colder seasons. This one allows you to sear meats on the stove top first, so you won’t have to use an extra skillet. In honor of St. Paddy's Day, we're bringing you a classic Irish Stew, cooked in your slow cooker. Whether you add the Guinness and / or wine or not, you'll still be left with a lot of heartiness to warm you on cold nights. Beef – Sprinkle with salt and pepper and tenderize. Optional step: Toss meat with flour. Heat a skillet over medium-high heat. Add oil and then sear meat until browned on the outside. Remove bay leaves. Season to taste with salt and pepper. Enjoy and have a happy St. Paddy’s Day!